The Funky Felter: Hey fiber enthusiasts! Do you have a drum carder or hand carders? Hey fiber enthusiasts! Do you have a drum carder or hand carders? I wanted to give a shout out to all those fiber enthusiasts who read my blog. It has been a long time since I posted about anything specifically fiber related. Today I want to get your opinion on drum carders and hand carders. For the past year or more, I have been wanting to purchase a drum carder. I have finally decided to save all of my Etsy and ArtFire money to buy one this Spring or hopefully a little sooner. I currently have hand carders (Strauch brand) which I don't use much anymore. It seems that my hands get tired much too quickly with those. My reasons for wanting a drum carder are........... I really want to be able to hand dye and mix my own fiber color blends for feltmaking. I'd also like to be able to sell some roving batts in my Etsy and my ArtFire shops. And, of course, because a drum carder would be a super fun new gadget for me to play with fiber - the best reason of all!! As you can see from the screen shot of carders available on Etsy, there are a lot to choose from. And, there are many more to choose from online elsewhere. 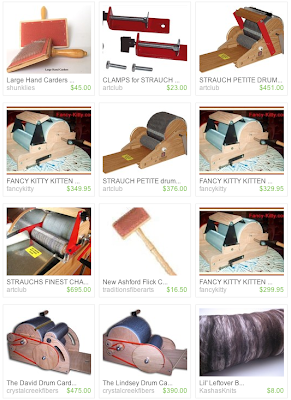 I am particularly enthralled by the Fancy Kitty drum carder which is a new brand to me at a very reasonable price. My questions for all you fiber enthusiasts out there are........... Do you have a drum carder or hand carders? Also, what type or brand do you recommend? And, if you don't have a drum carder, do you want one? If so, what kind and why? Please do leave a comment and let me know your thoughts! I am very excited now that I've finally decided to take the plunge and purchase a drum carder, but I'm still trying to figure out what to kind to buy. After all, it is a rather expensive investment. Thanks for your help my fellow fiber artists! which works well for carding fiber into batts. I have used it to mix fiber of different types or different colors. Check out http://members.peak.org/~spark/fiberpreparation.html for info on choosing a drum carder. Shalana, I used to have the Jr. Louet but never felt that it did a good job with my alpaca. I now have the Strauch Finest which is perfect. I love it and the only way that I could improve is if it had a motor. i have heard that louet make beautiful equipment that works well. i am thinking of getting a louet drum carder. i like the idea of not having to tease the wool before putting it in the drum. my question is about pickers. does anyone find it necessary to pick there wool before carding it? or can you card with out picking? I don't yet own a drum carder but our guild has a Patrick Green carder which is probably about 10 years old now and going strong. It's pricey but most of them are but it is a workhorse. I have heard good things about the Louet drum carder, also and not as expensive. I'd love to have one myself but the cost just keeps me from getting one so far. I want a carder too. I have heard the new Ashford Wild Drum Carder is good. It can take fabric strips and lace etc to make really chunky batts for felting. I'm with you on the tired hands from the hand carders. I feel it the next day.